Slice your watermelon in clean, safe and efficient way! Two rounded edge can easily slice the melon without causing a mess. 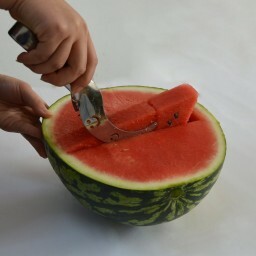 BE SMART, BE INNOVATIVE,BE AMERICAN - Slice your watermelon in clean, safe and efficient way! Two rounded edge can easily slice the melon without causing a mess. 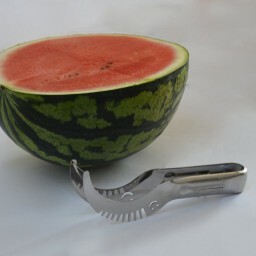 GREAT SUMMER GIFT - This watermelon corer is a great gift for every fruit lover! Satisfy your loved ones with this exceptional kitchen gadget! 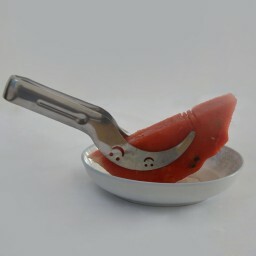 HIGH QUALITY DURABLE MATERIAL - In order to ensure long lasting product life these amazing watermelon slicers are made from highest quality stainless steel. EXCEPTIONAL DESIGN - This amazing corer are well designed and does not slip from your hand. 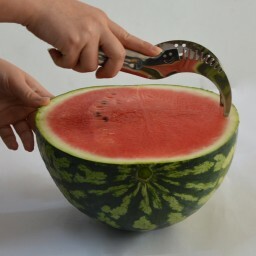 Well-designed grip protect hands from getting hurt while slicing watermelons. 100% SATISFACTION - High quality product combined with an outstanding customer service guarantees a complete satisfaction! We are dedicated to address any product/service issues and is committed to delivering a 5 star experience for all buyers.